Trump's ratings have worsened as his presidency bounced from one controversy to the next. Donald Trump has the worst approval and disapproval ratings among American voters of any president since at least Jimmy Carter. President Trump likes to proclaim his supposed popularity, despite losing the popular vote in the US election but still taking the White House thanks to the country's electoral college system. After his inauguration, his spokesman falsely claimed to have drawn the biggest crowds in history to Washington for the event, even though his predecessor, Barack Obama, drew more. Trump's poll ratings tell a different story to the one he peddles. Trump had an average approval rating of just 40.5% in the first 116 days of his presidency. His disapproval rating was 53.6%, meaning over half of the American population disapproved of him in his short time as president. 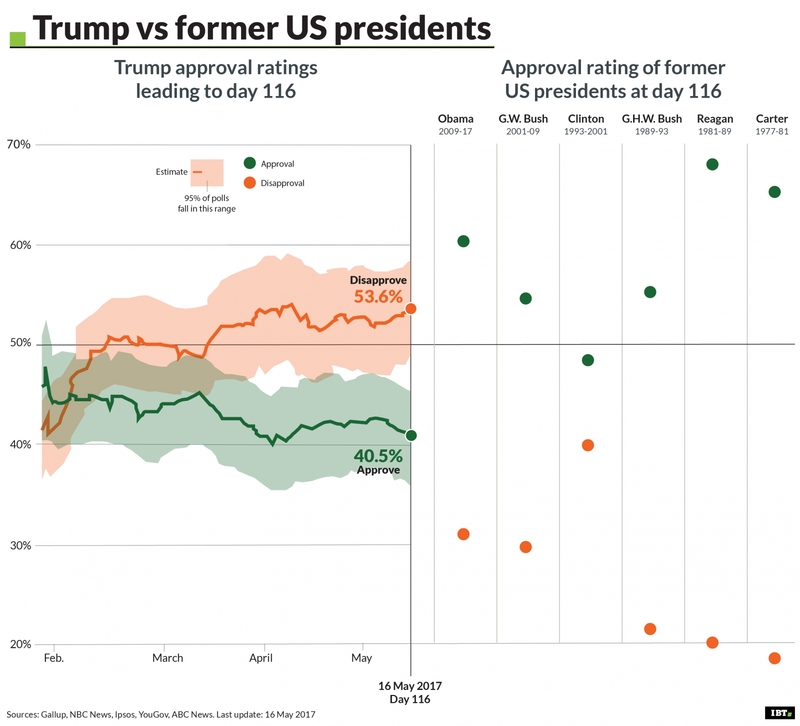 And, as IBTimes UK's analysis shows, his disapproval has risen and approval fallen steadily over his early presidency, which has been gripped by controversy and scandal, most notably the investigation by intelligence services into links between his election campaign and Russia. His summary sacking of FBI director James Comey, who was leading the Russia investigation, was deeply unpopular, widely condemned, and left many questioning why the decision was made. The White House claimed it was the result of Comey's blunders, but Trump's critics claimed it was to disrupt the investigation into his campaign. The Muslim travel ban debacle was another damaging moment for Trump. And his decision to bomb a Syrian regime airfield after the chemical attack on Khan Sheikhoun, which killed and wounded dozens of civilians, including children, sparked a rebellion among his own supporters. It was seen by many as a betrayal of his "America first" promise not to involve the country in other nations' affairs or spend taxpayer dollars on military adventures and bombing campaigns. Of the six presidents who came before Trump, the Republican Ronald Reagan, who was in office from 1981 to 1989, had the highest comparable approval rating at 68%. The president with the lowest disapproval rating was the Democrat Jimmy Carter at 18.8%.